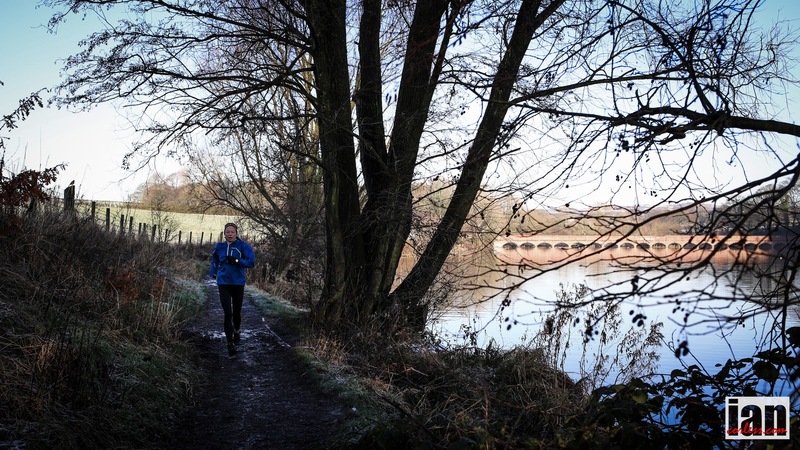 “I love running cross country…. I’ve always felt the same as Robin Williams about the indoor trainer. To me, training indoors on a bicycle is just like running on a track or treadmill. Yet, like track and the treadmill, cycling indoors can provide a huge advantage to your training if used in a structured way. 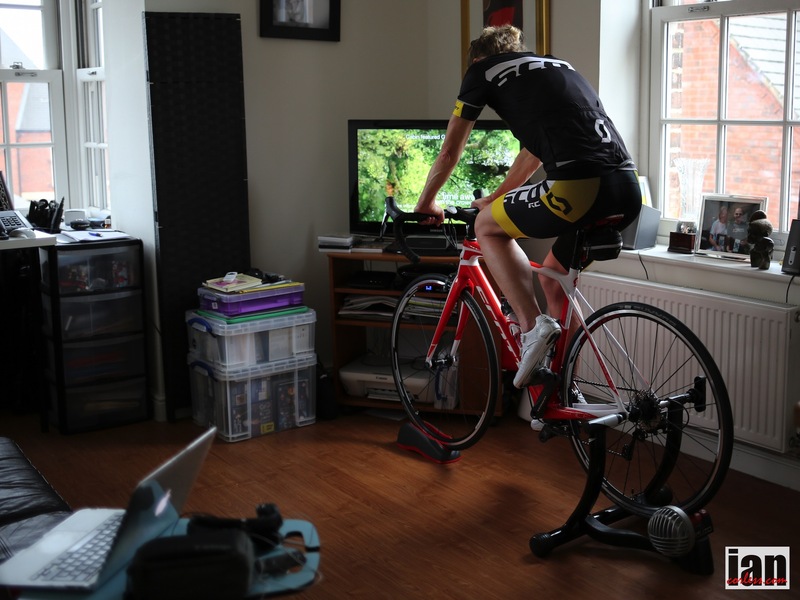 First and foremost when the weather is horrendous (like it is in the UK at the moment) you can get a good workout indoors in a warm, safe and controlled environment. I am new to cycling and although not inexperienced, braving winter conditions on a bike would be a step too far for me at the moment. 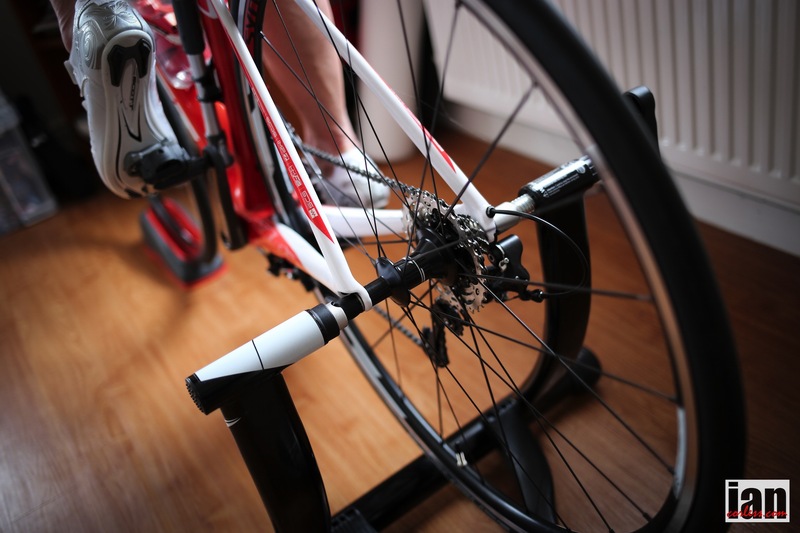 This is where the home trainer becomes a useful piece of equipment. I can still get my fix for the outdoors with my running… to be honest, I love running in cold temperatures but I also incorporate one treadmill session which allows for faster running (hills or intervals) with some fast-paced loud music which is difficult to do outside. 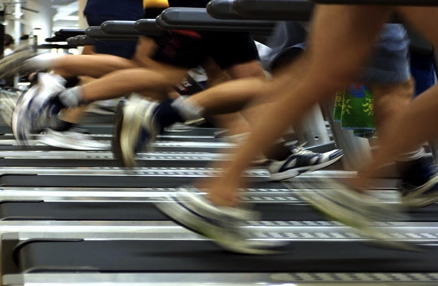 In a research project at John Moores University, researchers found that when participants exercised to faster-paced music they “chose to accept, and even prefer, a greater degree of effort”. As well as enhancing performance, music lowers the perception of effort. It dulls or masks some of the pain associated with training. We know from scanning the brain that when athletes are played loud upbeat music there is an increase in activity in the ascending reticular activating system. For all these reasons I have also been using the home trainer to get in some recovery training after racing or long run sessions. At the beginning of December I completed a 72km trail race at night in sub-zero temperatures. Conditions were very muddy, icy in some parts, with a head-on wind to contend with and as it was at night with poor visibility, the going was tough. Also I forgot to mention I flew out to Lyon on the Saturday, picked up my number, took a shuttle to the start in St Etienne, started the race at midnight, ran to Lyon through the night and flew back to London on Sunday, took a coach, another train ….All a bit crazy and exhausting to say the least. Over the next 2 days following the race, I suffered DOMS (delayed onset of muscle soreness). This meant no running for a few days. I had a fun run planned in Paris the following weekend so I decided to use cycling as “active” recovery. 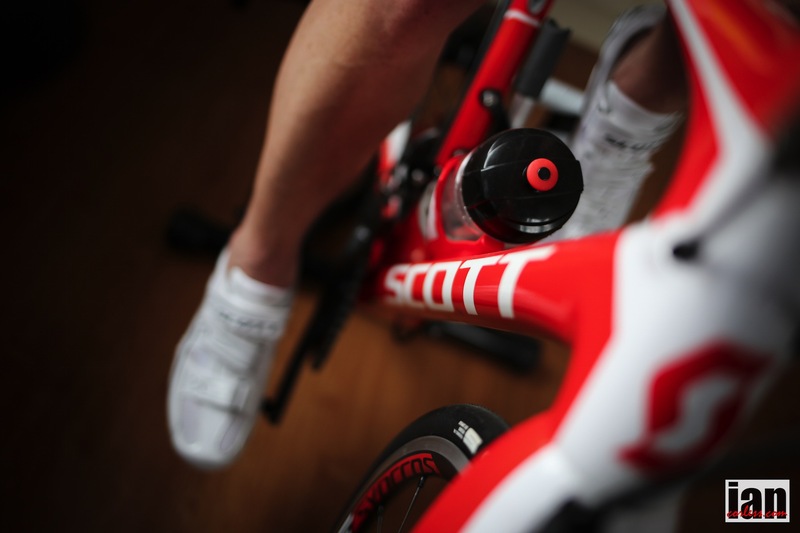 Like running on the treadmill you can quickly get hot very quickly on an indoor trainer. I set myself up near an open window to allow for some ventilation. If you were doing a hard session, an indoor fan would also be a good idea. Recovery is all about spinning my legs, easing away muscle soreness, getting the blood flowing and I suppose not having too much structure. However, I find indoor training easier if I have a plan to follow and music! Use your own bicycle. 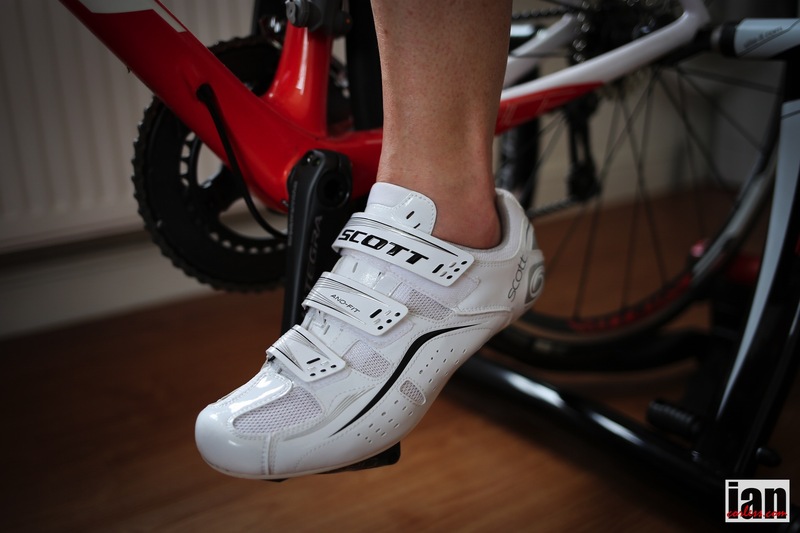 I am using my SCOTT bike fixed to my indoor trainer via the rear wheel. This is perfect as I do not compromise on my cycling position which I have worked hard to make perfect. Need some free music to help you with your indoor session? Try HERE for 50minutes of audio. I personally recommend that you make your own playlist that is specific for your session. Using something like iTunes makes this really easy. Alternatively, a company like Audiofuel provides specific music mixes with or without coaching. Main Set: 24min alternating 3min at 90 cadence and 3min at 110 cadence. 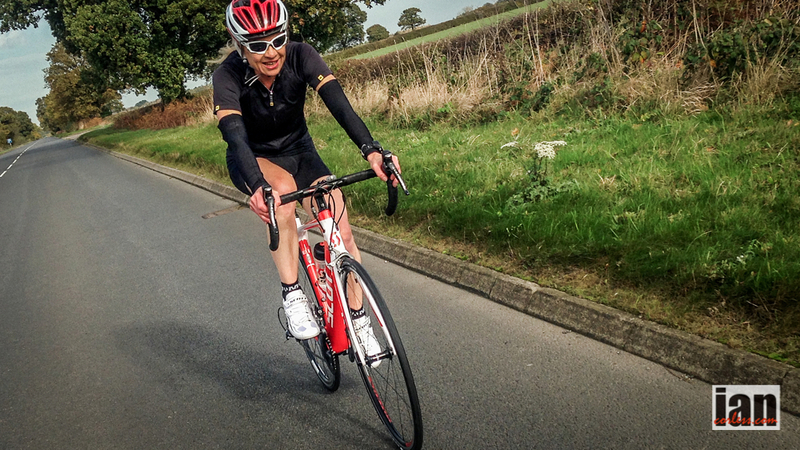 Gearing should be easy and light to allow your legs to spin around. The faster cadence session of 110 allows me to concentrate on cycling technique using the up and down of the pedal stroke and adds souplesse to my legs. Initially you will find your legs struggling to get used to using different muscle groups in this recovery work-out. The aim is not to PUSH the gears or have resistance. We don’t want to stress sore muscles. 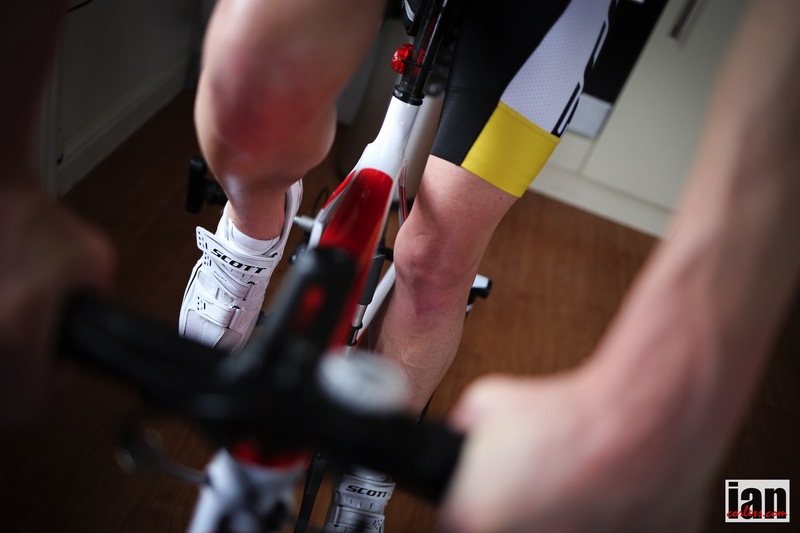 These two sessions are all about spinning legs with an easy gear on the bike and allowing the muscles to recover. This is what is so great about cycling… you can exercise in a non weight bearing way. 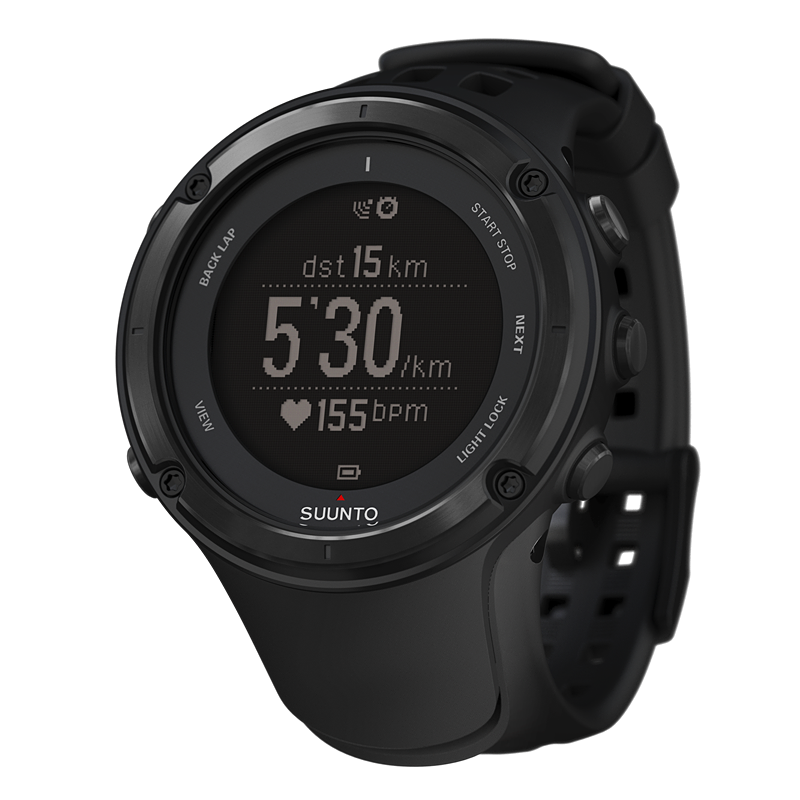 However, the increased cadence sessions of 110 and 120 will allow you to raise your heart rate. I shall be doing a turbo session at least once a week as active recovery in my build up to my next long distance run, Paris Mantes 50km towards the end of January. This will be followed by a week off running but 2 turbo sessions before a trip to Costa Rica and the opportunity to run The Coastal Challenge stage race. Happy New Year and remember, cycling is great for running if used sensibly. This entry was posted in Cycling for Runners, Uncategorized and tagged Ambit2, cycling for recovery, cycling for runners, cycling indoors, cyclingforrunners, girl what cycles, girlwhatcycles, indoor cycling, Niandi Carmont, recovery, Scott, scott bikes, Scott Sports, Suunto, suunto ambit 2, trail, Ultra by talkultra. Bookmark the permalink.